The impact of the global credit crunch could have been minimised by better regulation of US banks, US Treasury Secretary has admitted. Henry Paulson denied the regulatory system had "failed" but acknowledged that it could have "performed better". He told the BBC his main focus was limiting the "spillover" from the banking crisis to the US economy. In the same interview, Chancellor Alistair Darling said that rising oil prices were a "real problem". With oil prices now above $145 a barrel, Mr Darling said G8 leaders meeting next week urgently needed to address the requirement for increased crude supplies. 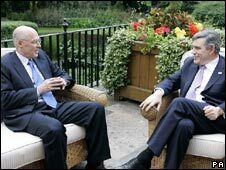 Mr Paulson held talks with Prime Minister Gordon Brown on Wednesday, and staged a joint news conference with Mr Darling after meeting top UK bankers. In his remarks, Mr Paulson warned that there was no easy, short-term solution to high oil prices, and said that the cost of oil was likely to prolong the US slowdown, possibly into 2009. He said the current level of oil prices was "unacceptable to the American people" and that all his efforts were focused on dealing with the matter. But he admitted that the basic problem was that there was not enough oil to meet the growing demand - and it was not clear whether producers such as Saudi Arabia actually had the capacity to increase output further. In the longer term, he argued that a wide range of measures, including energy conservation, the development of more oil fields, and switching to cleaner technology, could bring about a reduction in the oil price. And he announced that the UK and the US would be bringing forward plans for a large clean energy loan facility at the G8 meeting next week. Mr Paulson praised his counterpart's handling of the Northern Rock crisis and the current economic turbulence, saying he was "on his toes". "There is a lot of co-operation going on right now between the UK and US in developing the right policy responses," Mr Paulson said. Both admitted there should have been earlier warning of the turmoil that hit global credit markets last year and that policymakers needed to raise their game. "There is no doubt that that there were mistakes made by banks, regulators and investors," Mr Paulson said, adding that he was "encouraged" by banks' efforts to acknowledge the size of their losses and repair their balance sheets. Mr Darling said the US and UK had "led the way" in addressing shortcomings in how the global banking system was policed. "Whether it is the government, the Bank of England or the Financial Services Authority, we need to tighten up what we are doing," he said. Mr Paulson has said the US must devise a tougher regulatory system that can allow financial institutions to fail without causing wider economic turbulence. The Federal Reserve stepped in to support investment bank Bear Stearns in March after confidence in the firm's financial position evaporated. Minutes of meetings held by the Fed at the time of the crisis showed that officials were worried about the prospect of "contagion" from the possible collapse of Bear Stearns with broader disruption to financial markets. However, he said it was not the government's job to dictate how much bank bosses who have lost their jobs as a result of the credit crunch should be paid in compensation. "No-one wants to see high compensation for failure," he said. But he added: "I believe in market discipline. I think we are going to see markets react." In an interview with BBC Newsnight to be broadcast later on Thursday, Mr Paulson will say the current economic downturn "has further to go". He admits the US economy is going through a "tough period" because of the combination of the spike in oil prices, the credit crunch and housing slump. But he is more upbeat about prospects for the rest of the year, saying he believes growth will improve at the end of 2008. He adds that on his travels around the world he had found that inflation had been the issue that was the top focus for governments, rather than the credit crunch. But he declines to be drawn on whether that meant that the Federal Reserve's aggressive cutting of interest rates had been a mistake. The full interview with Mr Paulson will be broadcast on Newsnight on BBC2 at 2230 BST on Thursday.